Battery Type: 3.6 V Lithium. To activate the tracking sensor, press on the ConceptOne label for less than five seconds to activate the hidden smart switch. To de-activate the sensor, press on the ConceptOne label for more than five seconds. ConceptOne represents a family of sensor monitoring products from the Company that has provided unique, cost effective solutions since 1986. This battery operated, wireless ConceptOne product enables the monitoring of temperatures with an easy to install system. 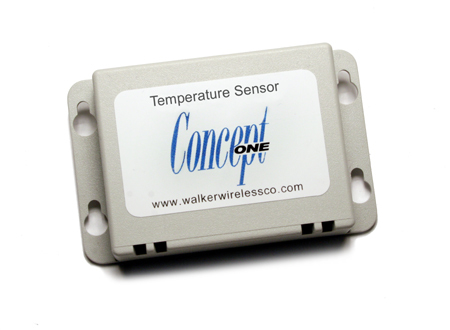 The ConceptOne Temperature Humidity Tracking Sensor is a battery operated digital temperature and relative humidity sensor with a built-in microprocessor controlled 418 MHz FCC certified radio transmitter. A Point Manager receiver is required. Repeaters may be required depending on locations and required wireless transmission distances. This extremely small tracking sensor, measures only 2.0" x 2.5" x 1.0" (including mounting flange) and weighs only two ounces. Our complete wireless network costs less than just the electrical wiring for other temperature and humidity tracking systems. No Power Wires Required. No Data Cables Required. Small size, low weight, fast and easy installation.